Portable Keyboard for Practicing Piano: What to Look for? Image by PIRO4D from Pixabay. One of the biggest disadvantages of playing the piano is that you can’t throw it in a case and take it with you. This is why many pianists use portable keyboards for practicing piano. A keyboard you can carry with you at no great inconvenience is wonderful, but it comes with very obvious compromises. First, let’s talk about the glaring advantage, it’s portable! There are a lot of reasons that make having a portable keyboard an appealing option. A common choice of keyboard for performers is the Nord Stage 3, it can be moved but it’s very heavy. Similar keyboards/synths have the same issue, Yamaha MOTIF, Roland Fantom, they are all heavy. Many musicians choose to save these kinds of keyboards for gigging and take something much lighter to rehearsals. You might be going on a trip that doesn’t involve performing at all but still want to practice piano. Even at home don’t underestimate the value of a portable keyboard. If you have a busy household, finding a quiet spot to practice piano can be difficult. Having something you can move from room to room quickly and easily might be your only way. For these reasons and many more, a portable keyboard is a very desirable option. What it really comes down to is the question what do you need it for? Depending on your needs there will be acceptable and unacceptable sacrifices. Before even thinking about the obvious things like size and weight, let’s talk about sound. If you are buying a portable keyboard primarily for practice, then the price will likely be a factor. High-end keyboards with amazing sounds tend to be heavy. Cheaper portable keyboards don’t tend to have the same quality or range of sounds. If you want it mainly to practice alone this won’t be as big an issue for you. But if you are using it for group rehearsals then it’s a different story. In a group setting, you need to consider how much the actual sound affects the practice. For example, a song with a very specific synth sound may not feel the same with another sound. So, you have to consider both the positive and negative impact on your rehearsal time. I should also be clear that you can get lightweight, portable keyboards with amazing quality and range of sound. That’s if you are happy to pay a higher price. My first suggestion would be to consider sound quality versus price. This should help you figure out where you can and can’t sacrifice. Assuming the main purpose of the keyboard will be to practice the piano, then the number and kind of keys are very important. What I mean by this is using a piano sound more than say a synth or organ where weighted keys aren’t an issue. The lowest number of keys I would consider worthwhile is 49 or 61. Anything below 49 really limits what you can practice. For practicing scales, modes and, harmony, 49 keys are absolutely fine. For practicing specific pieces, for example, classical music, you may run out of octaves fast. I would suggest 61 keys allow for a much wider range of use. Most portable keyboards will have touch sensitive keys but not weighted keys. If you are practicing material where expression and feel are important, this will be an issue. If you perform on weighted keys then the inconsistency between practice and performance could do more harm than good. Graded soft touch is a term that you will hear often with portable keyboard keys. It means the keys gradually get heavier from low to high. Overall this offers a light feeling of weight in the keys but not quite semi-weighted. Graded soft touch keys are often an acceptable compromise when you want to keep the weight down. The overall weight is the biggest positive for a portable keyboard. The total weight of the keyboard is determined by the two factors we just covered, number and weight of keys. The more keys you have, the longer the keyboard, the heavier it is. In the same fashion, non-weighted to semi-weighted to fully-weighted keys adds to the overall weight at each step. In the 49-key range, all keyboards will be lightweight but there are some other things to consider. Many keyboards of 49 keys or less don’t have full-size keys, they have smaller, shorter keys. This is something I’d strongly avoid when practicing piano. One example of 49 full-size keys is the Casio CTK-240. This keyboard has 100 built-in sounds, 100 rhythms and it’s very lightweight (6.2 lbs). If you just want a keyboard that makes a piano sound and can be taken anywhere, this is worth a look. 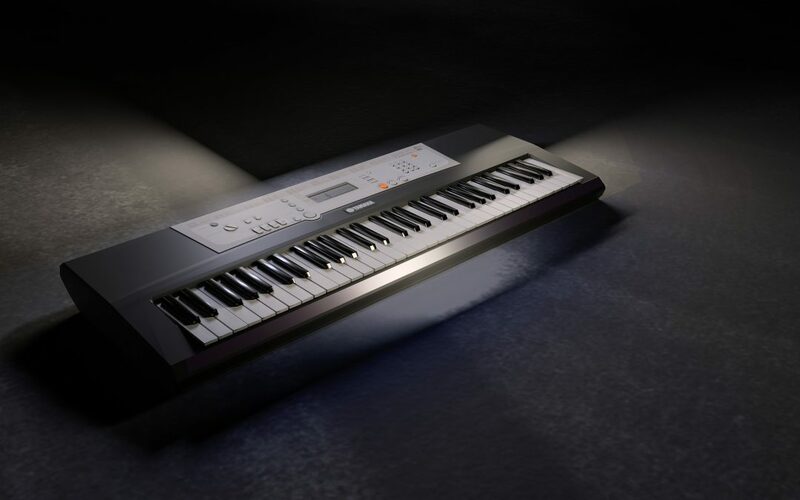 Yamaha PSR-E363: A portable keyboard with 61 velocity sensitive keys. It has over 500 built-in sounds, including some of Yamaha’s trademarked sounds usually found in more expensive keyboards. The PSR-E363 costs approximately $180 and weigh around 10 lbs. Casio CTK-3500: 61 two-stage velocity sensitive keys with 400 built-in sounds. The CTK-3500 costs approximately $130 and weigh 7.4 lbs. To give you something else to think about, if you have a laptop you can also consider MIDI controllers. 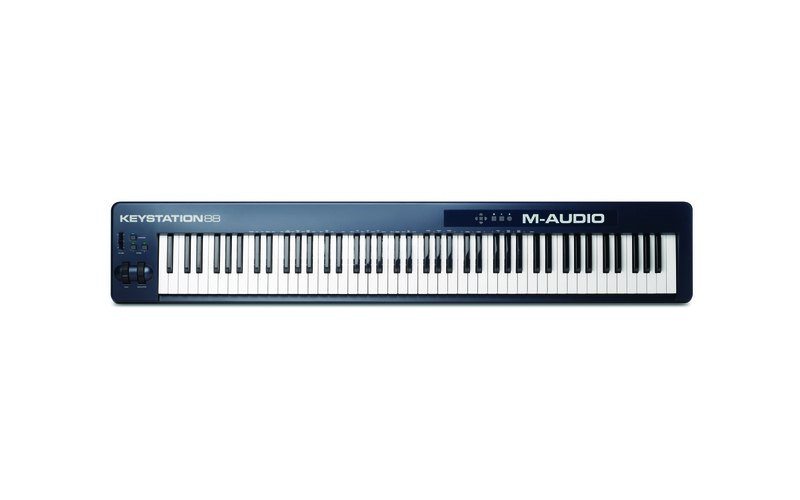 You can get 88 semi-weighted keys, like the M-Audio Keystation for around $200. So, 88 keys mean a longer keyboard, more awkward and less portable but it’s very, very light at 17 lbs. It comes with premium virtual instruments that will beat the sound quality of any of the other keyboards I mentioned above. Whatever keyboard you choose it’s always going to be a trade-off of qualities. Sound vs weight vs key action vs price, naturally when one factor changes it alters the others. Think about exactly what you want from it, prioritize your needs then find the best compromise.